Has a Seller Slowdown Begun in SW Florida? For months we’ve been telling sellers it may cost them to wait when selling their home. This is true for a variety of reasons, but the two most important are when you sell, chances are the home you’ll purchase to replace your current home is also increasing in value, and because rising rates affects your buyer and your next loan too if you’re getting one. That’s not the purpose of this article though. While sellers wait for the absolute highest prices on their home, they should keep in mind that prices won’t rise 12% per year forever. We’re predicting another good season. Inventory is low, rates are still pretty low, and demand is high. However, demand begins to fall off at certain prices. So we ask the question, has a seller slowdown begun in SW Florida? Let’s take a deeper look. If you look at the graphs, you’ll notice that typically home prices peek around April each year and again in June. Many times June is even better than April. This year, we saw the peak in April but didn’t see the 2nd peak in June. Furthermore, homes closed in SW Florida usually peaks around May, and then we see some strength in July-August, albeit not quite at May levels. This year August numbers fell off. This could be due to lower inventory levels, but it could also be the start of a trend. We’re cautious not to read too much into any one month period, and moving forward this will be especially true as new Federal lending and closing guidelines will extend financed closings out longer. Cash sales in August for single family homes were 37.4%. This was a 20% decline from the previous year. This is good news as financing has helped push prices higher. We always said this market will not be fully healed until financing and capital comes back into the market. We have that now, but with that come appraisal issues and closing delays. We think we’ve got an excellent market. Buyers are shopping though and are price sensitive. Even with low inventory, if a property is over-priced buyers are sitting on the sidelines. October begins the start of Season. Last year we saw an uptick in buyer activity in October. It used to be said Season was January-April but it’s started earlier. We think we’ll have another great season, but sellers may not want to wait much longer. The graphs may be a sign of things to watch, or they could just be a temporary blip. Some economists are talking about recession starting in 2018 while others are talking about the end of 2016.. Nobody can predict accurately when a market will bottom or when it will top, but looking back there are generally signs that foretold the future and they were ignored. People tend to follow the herd and ignore signs because when it’s all good, they want to believe. And when a market is near bottom, nobody wants to believe it’s over until they see proof. Thus, people usually miss the top and the bottom because they wait until they see the change on paper. For this reason, most people will absolutely miss the top and the bottom unless they just get plain lucky. Bottom line is we’ve got a great market. Just don’t get too greedy and over-price your home. Over-priced homes sit in any market, and you don’t want to look back and say I missed another boom market like 2006 simply because I got greedy again. It’s Independence Day here in SW Florida and across the great United States so it’s time to celebrate. What a great country we live in. Local sellers are rejoicing as well as new reports show more homeowners celebrate their independence from their underwater mortgage. For years homeowners were trapped in their home because they owed too much money to sell it. Inventory is limited across the country because of it. In fact, it’s causing an affordability crisis in many lower end neighborhoods because they are 3 times more likely to be underwater as homes in the top third. Buyers are having a hard time finding an affordable home in these areas. Here in SW Florida we have an inventory shortage. The good news is many that were underwater could sell now when they choose to. They are no longer trapped in a home they don’t need or a mortgage that’s tough to afford. 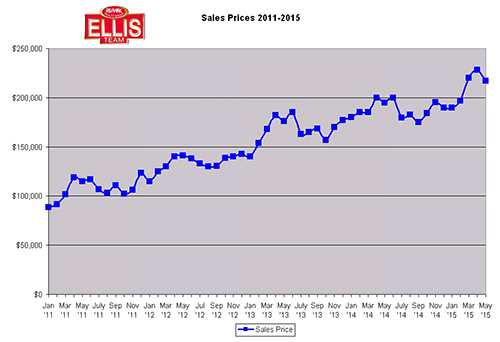 As you can see from the Home Prices graph media sale prices have increased 145.48% since January 2011. That’s just what the doctor ordered for many sellers. Our prices were over-valued but they fell too far and too fast. Our market has healed and the economy is doing better in Florida than the rest of the country. We wrote last year that one of the final steps to a healing housing market would be an increase in financed sales. We’ve written on this many times. If you really care to research search the term cash sales on our Blog. 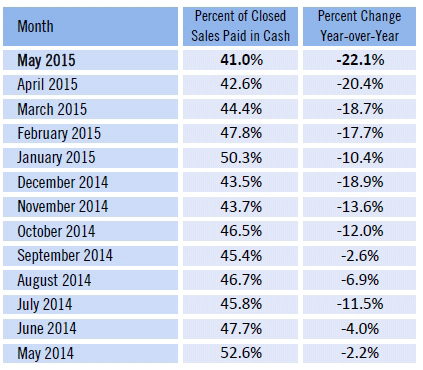 Cash sales are at their lowest point since the downturn. This means an infusion of capital and confidence has come back into the market. Cash buyers were never going to propel this market to a normal healthy level. Cash buyers were limited, and many wanted a good deal when the market was down. They didn’t want to overpay. Today it’s different. With inventory so low sometimes cash is King, but the difference is they have to pay market value even with cash to compete against all the other buyers. Several years ago we had multiple offers, but only because they were basement prices. Today we have multiple offers from end users who want the property to enjoy, not just flip. Banks have become more confident in home values, appraisals, and lending again. Banks were gun-shy too, but now real estate is seen as a solid investment. Depending on how things turn out with Greece, Puerto Rico, and the Euro, hard assets may become king again and there may be a flight from stocks to real estate again. If you’d like to search for your piece of paradise here in SW Florida check out www.LeeCountyOnline.com It has all the listings and it’s fun and easy to search. You can even find out how much your home is worth there too. Making a move is a complicated process. Talking to a Realtor who understands the process and what it takes to sell a home so you can buy another one is Gold. We are experienced and we can help you. It’s just communication and working through your needs and finding solutions. If you’d like to speak with us, call us at 239-489-4042 or send us an email Brett@topagent.com You can always use our website too and we can get back in touch with you. Enjoy your weekend and celebrate your Independence, both as a country and possibly as a homeowner. We have some additional pages you might like. We have many more so head on over and check them out.